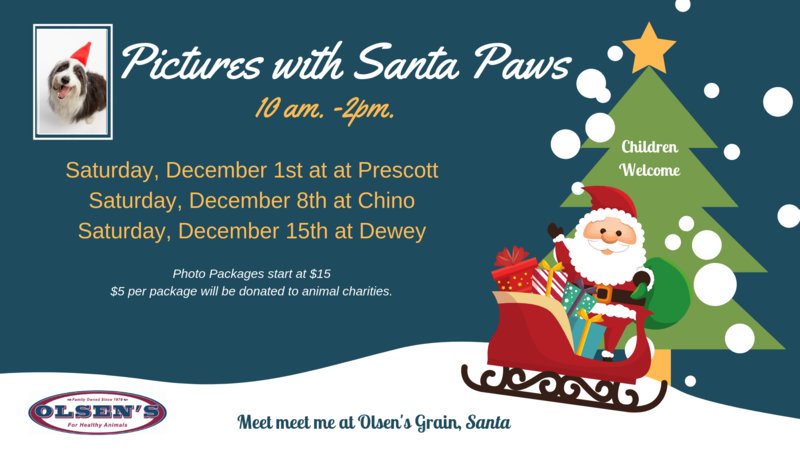 Pictures with Santa Paws is back at Olsen’s Prescott, Dewey, Verde and Chino stores for pet photos. From 10 am ’til 1 pm. Bring your furry family members in for photos with Santa and be the envy of your social media friends and family! Holiday pet photos are always a hit when you share them on Facebook. Children are welcome too! For every photo package purchased, $5 will be donated to local animal charities. Photography will be provided by WindyView Designs a local design print shop that prints a wide variety of paper products, garments, and signage. We hope to see you and your pets at our annual Pictures with Santa Paws events! This entry was posted on Wednesday, November 14th, 2018 at 6:34 pm	and is filed under Events, News & Updates. You can follow any responses to this entry through the RSS 2.0 feed. Both comments and pings are currently closed.